Last weekend was the first of the new office hours — the kind where you can come with your blogging or RSS questions and get help and ideas from me and the other bloggers around. (For free!) You can also just come and hang out and drink coffee and meet neighbors. People came with great questions. We tackled adding badges to a blog sidebar, learning how to resize images, and setting up Google Analytics on a couple of people’s blogs to track stats. Someone was planning a new business blog, and we talked about whether WordPress would be right for it, and about hosting WordPress on your own server versus using the free hosted version. People helped each other, and there was a lot of just hanging out, too. 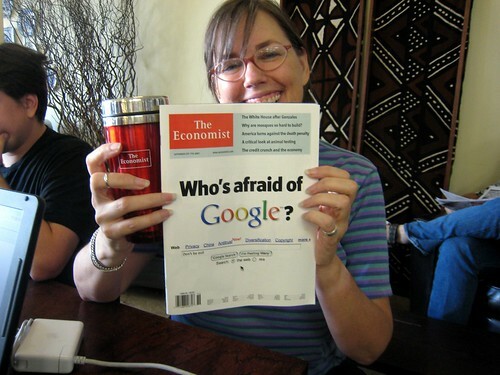 Susan brought the Economist’s Who’s afraid of Google? article. 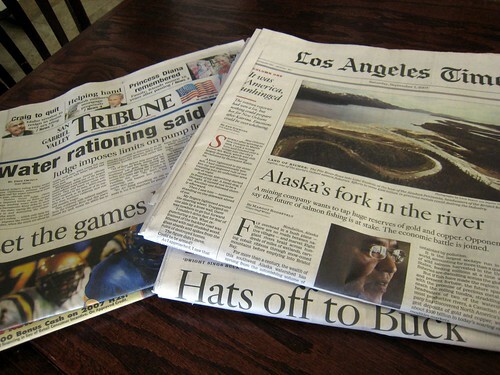 Ed Padgett from the Los Angeles Times Pressmens 20 Years Club came to visit and brought us copies of the SGV Tribune and the LA Times, since I’m turning into a paper reader. Metropolitan opened at 9:45 a.m. that day, which was odd since their posted hours said they opened at 7:30 a.m. It got me thinking, though, that 10:00 a.m. really is a more sensible time to be up and out on a Saturday morning, so next time — September 15 — we’ll start at 10:00 a.m. Come on by with questions, ideas, food for thought, or just your neighborly self. I don’t know if this is something you would receptive to but it seems like it might be constructive to invite all media, bloggers or not, to discuss what people are doing in this town? Political art, or otherwise. Seems like we all have a common goal, to inform! I just discovered this cute coffee shop you may be interested in for office hours (you probably already know it) Zephyr Coffee House and Art Gallery. They are also wireless. (http://zephyrcoffeeandart.com/) It is located in a craftsman style house. They feature rotating art exhibits and musical performances. How FUN! Love the idea of your office hours! Oooh Zephyr was wireless now? That’s great! I haven’t tried it yet — please let me know how it is if you do! I just called Zephyr and they said they don’t have WiFi. Sorry- I saw people using their laptops and assumed it was wireless. Jill, the photo you took of moi+Economist was used by someone on a site called Compassion in Politics. I’m going there (again) to ask the blogger to link to both of our sites. Thought you’d like to know.